Experience the most stunning sceneries of all three beautiful bays of The Gulf of Tonkin and the amazing island of Cat Ba on board The Au Co. Enjoy a biking promenade in the rain forest of the National Park on Cat Ba Island, follow our guide for a kayaking excursion in the hidden lagoons of Lan Ha Bay or visit a peaceful floating village in Bai Tu Long Bay on a traditional rowing boat. While aboard, discover The Au Co’s signature 5 elements cuisine, re-energize with tai chi, unwind on the sundeck or just pamper yourself in the Jacuzzi or with a Vietnamese massage. 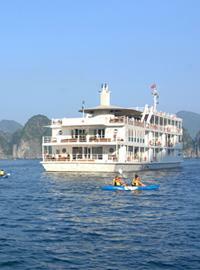 Launching in April 2012, The Au Co is the most luxurious cruise operator specialising in offering a three-day two-night voyage through world-renowned Halong Bay, Lan Ha and Bai Tu Long, as well as Cat Ba Island, with its renowned National Park. Each of her 32 spaciously-designed private cabins boasts luxurious bathrooms and panoramic balconies.